Does Your Business Meet OSHA, ADA and ASTM/NFSI Floor Slip Resistance Standards? 2. 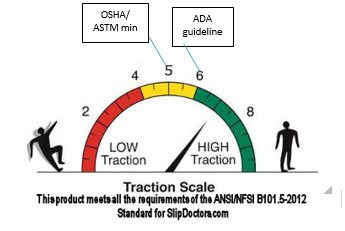 Measurement - No Slip, Just Grip then uses a professional –grade Slip Meter, to assess the Static Coefficient of Friction ( S.C.O.F ) of your floors, to determine if your floors meet ADA or OSHA guidelines. 3. Certified Treatment – We prefer to first treat a small area with our proprietary process, at NO COST TO YOU, so you can experience the difference between the “treated” and “untreated” surfaces. Once you have approved the full service, we will apply the “micro-tread” treatment to your entire floor, until your SCOF exceeds OSHA/ADA guidelines. 4. Follow-up – Even though our treatment is guaranteed for several years, No Slip, Just Grip conducts scheduled, bi-annual visits to test and measure treated areas to ensure proper traction levels are maintained. •	The ADA (Americans Disabilities Act) recommends the dry static COF of 0.6 on any flat or horizontal surfaces both wet and dry, but 0.8 for any inclined or ramp areas. •	OSHA currently recommends that the static COF be at least 0.5 for all walkway surfaces under both wet and dry conditions. •	Equal to or greater than .60 — Excellent friction. •	Equal to or greater than . 50 — Adequate. •	Equal to or less than .40 — Caution necessary. Coefficient of Friction (COF) is defined as the friction force opposing sliding motion divided by the force normal to the surface. People walk differently (most people demand a consistent COF of between 0.25 – 0.3 walking normally). Long fast strides demand a higher friction. Although slippery surfaces or steep slopes provide low COF, we often perceive the potentially dangerous floor, shorten our stride and walk slowly. Including the presence of moisture, contaminants or dirt, and a 0.6 COF should be demanded for safety. Static Coefficient of Friction (SCOF) is defined as follows: The ratio of the horizontal component of force applied to a body that just overcomes the resistance to slipping to the vertical component of the weight of the object or force applied. The higher the number the lower probability of slipper occurs. Per NFSI B101.1 SCOF > .60 is considered “High Traction”. All Slip Stoppers products fall into this tier of High Traction. Friction is the action of one surface or object rubbing against another. There are two primary types of friction: dynamic friction and static friction. Dynamic friction is the friction between two moving surfaces or objects. Static friction is the friction between two objects that are not moving. The American with Disabilities Act (ADA) was enacted in 1990 to guarantee equal opportunities for individuals with disabilities. 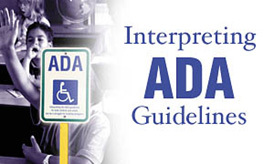 The ADA made it illegal to discriminate on the basis of disability in employment, transportation, telecommunications, state and local government and public accommodations. In 2003 the ADA advisory on surface conditions issued “Bulletin 4” which recommended a static coefficient of friction (SCOF) value of 0.6 for level surfaces and .8 for ramps and inclined surfaces. The Occupational Safety and Health Administration (OSHA) was founded in 1970 with the mission to “assure safe and healthful working conditions for working men and women by setting and enforcing standards and by providing training, outreach, education and assistance.” OSHA inspectors can issue citations to businesses and property owners for excessively slippery floors. The Occupational Safety and Health Administration (OSHA) recommends that all walking surfaces have a Static Coefficient of Friction (S.C.O.F.) of 0.50. The Architectural and Transport Barriers Compliance Board (Access Board) conducted tests and concluded a higher coefficient of friction is necessary. The Access Board advises a static coefficient of friction of 0.60 is recommended for accessible routes and 0.80 for ramps. Most tile and concrete surfaces are designed to pass a 0.50 (S.C.O.F.) test on a dry surface. Most floor finishes are not designed to pass the new advisory standards, especially when wet . ANSI (American National Standard Institute) was founded in 1918 with the mission “to enhance both the global competitiveness of U.S. business and the U.S. quality of life by promoting and facilitating voluntary consensus standards and conformity assessment systems, and safeguarding their integrity.” ANSI oversees the creation, promulgation and use of thousands of norms and guidelines that directly impact businesses in nearly every sector: from acoustical devices to construction equipment, from dairy and livestock production to energy distribution, and many more. The NFSI (National Floor Safety Institute) is a 501(c) (3) not-for-profit organization. NFSI was founded in 1997 with the intention of preventing slip and fall accidents by educating the public and businesses through informative programming, research, training and product certification. NFSI certifies flooring materials, coatings, chemical floor-cleaning products, and treatments. ANSI and NFSI have devised various detailed standards for measuring the Coefficient of Friction (COF) of a surface. The intent of this standard is to help in the reduction of falls due to conditions, which in some fashion are manageable. The standard in its present form provides for the minimum performance requirements necessary for increased safety on walking/working surfaces in the workplace.